← Convert pcl to pdf and rotate page via command line? How to convert MS Office PowerPoint documents of PPT to EPI? Actually, EPI is the compressed archive created by EclipsePackager2000 which is a program used for splitting and compressing files. EPI file may contain a complete archive or a portion of a split archive. EPI files are used to separate large files into smaller segments for distribution over the Internet, email, or other external media. It will be easy enough to convert MS Office PowerPoint document of ppt to epi or pptx to epi with the help of docPrint Document Converter Professional which is a powerful document converter. It can convert Word, Excel, PowerPoint, WordPerfect, AutoCAD DWG, PostScript, Adobe Acrobat PDF and many other document types to Adobe Acrobat PDF, PostScript, EPS, XPS, PCL, JPEG, TIFF, PNG, PCX, EMF, WMF, GIF, TGA, PIC, PCD and BMP formats. As one application of docPrint Document Converter Professional which is also called as docPrint Pro, the virtual printer is not only a simple Windows printer which can save paper and ink, it is also a document converter which can convert any printable document to 50+ graphics. To use docPirnt, you should download docPrint Pro at http://www.verypdf.com/artprint/docprint_pro_setup.exe for free trail. 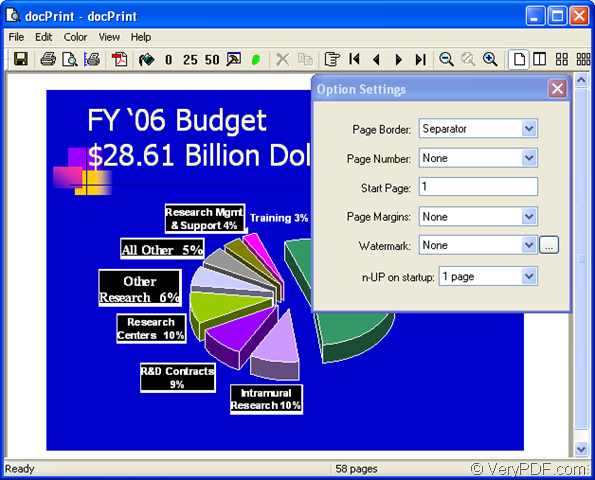 There are other two applications in docPrint Pro—GUI application and command line application. docPrint is easy to use by just printing printable document to it. Please see the detailed operations below. 1. You should open a PPT document and click “File”—“Print” to open “Print” dialog box in which you are able to choose the current printer as “docPrint” in “Printer” combo box. Then please click “Print” button to close this dialog box and continue the work. If you use the hot key “Ctrl”+ “P”, the effect is the same. If docPrint is the default printer on the computer, please right click the PPT document and choose “Print” option to run the printer directly. 2. Please see the main window form of docPrint in Figure1. You can see some buttons in the toolbar and a small dialog box on the right. There is no need to care about them if you want to convert ppt to epi only without setting any parameters to the target files. 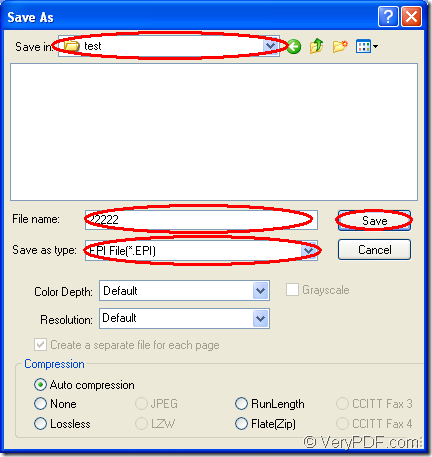 You just need to open “Save As” dialog box by clicking “File”—“Save as” or using the “Save File” button in the toolbar. You can also use the hot key “Ctrl”+ “S”. 3. Then you will see the “Save As” dialog box on the screen. Please see the snapshot in Figure2. In this dialog box, you should specify the directory for all the target files in “Save in” combo box, input the name of the target files in “File name” edit box. 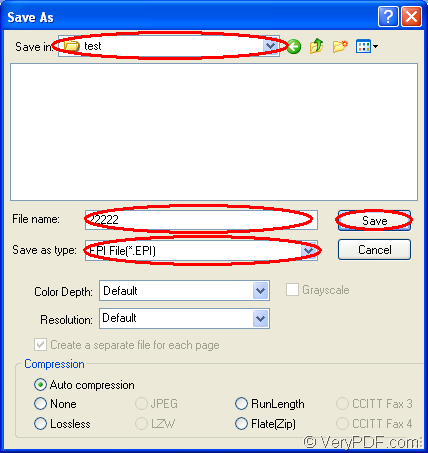 Then choose the file format for the target files in “Save as type” combo box and click “Save” button to save all the changes. The target files will appear in the specified location in a short while. To browse them, you can choose one kind of image processing or editing program. If you want to know more information about docPrint Pro, please click here. How to convert documents of Microsoft Office PowerPoint to EPI? How to convert MS Office PowerPoint documents of PPT to JP2? How to print docx to ps? This entry was posted in docPrint Pro and tagged ppt to epi. Bookmark the permalink.